“Le Magnifique,” a spectacular statue honoring the career and achievements of Mario Lemieux, was unveiled today in a public ceremony at CONSOL Energy Center. 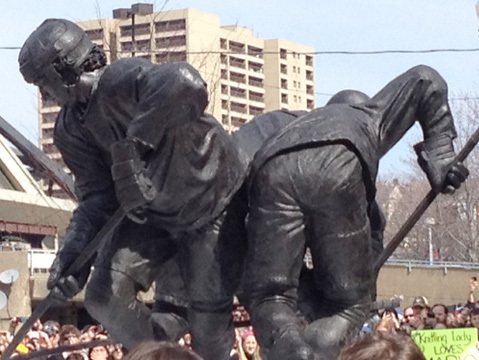 The larger-than-life bronze statue, featuring the great Lemieux bursting through two defensemen on his way to the goal, is located in the plaza outside the Trib Total Media Gate, near the intersection of Centre Avenue and Washington Place. The Penguins have posted a 0-3-0 record vs the Islanders since the statue was unveiled. Lets find a way to reverse this curse!!!!!!! Welome everyone to the official game day thread!!!!!!! butch goring and howie rose... seemingly a bit overconfident! Love a blow out with lots of goals, but that doesn't happen with the isles. I'll be happy with a victory. I expect a great start from the Pens tonight. They got the crap kicked out of them on home ice by an inferior team last time they met. Oh God, the PP gets to set the tone early. I was gonna say decline there power play but thank you Neal. Neal makes it look so easy.